One of the most versatile doublets in our clothing collection. Made of a rich, black and silver cotton brocade in the body, trimmed out in black cotton velvet. The entire doublet is decorated with velvet-covered buttons, and adorned along the edges with silver lace. 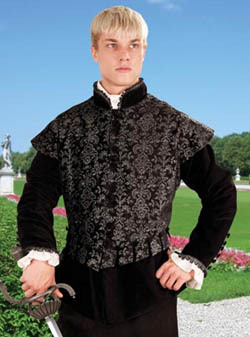 Removable, period appropriate sleeves, turns this garment from a doublet into a fanciful renaissance jerkin. Neck 14" - 14.5" 15" - 15.5" 16" - 16.5" 17" - 17.5"
Waist 28" - 30" 32" - 34" 36" - 38" 40" - 42"
Sleeve 32.5" - 33" 33.5" - 34" 34.5" - 35" 35.5" - 36"